Does it get any better than this? Perhaps. But we think it’s pretty darned cool! This is from last year but if you have not seen it yet, you’re missing a real treat. If you have, well it’s worth seeing it again because it’s just that awesome. Most of us remember the lovable voice of Winnie the Pooh. He is a childhood classic. And of course, those of us who are Star Wars fans (pretty much all of you reading, right?) also know that Darth Vader is a classic character we don’t forget. So what do you get when you combine the two? Well, this video below shows exactly what you get. Hilarity! 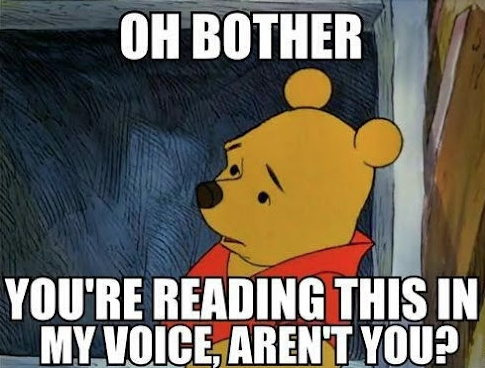 The voice of Winnie the Pooh reads Darth Vader’s lines from Star Wars. At the 2013 ConnectiCon Convention, voice actor Jim Cummings treats fans to a reading of Darth Vader’s lines from “Star Wars” as Winnie the Pooh. Known as the voice behind over 400 roles, Cummings is the current actor for both Winnie the Pooh and Tigger. Hah! How can you see good ol’ Pooh Bear without thinking of his voice?